If you’re off to a festival this year, you’ll need to think about packing light (prioritise the beer people! ), meaning there simply isn’t room for endless supplies of make up or your favourite 10 body lotions ‘just in case’. Practicality is key, but that still is NO REASON for baby wipe showers. Never. Never ever. In this post I’ll give you my advice on some amazing multi-taskers, and the best ways to keep clean in a fuss-free fashion…. I was recently sent this kit from the lovely Green People and couldn’t be more impressed. They have got this SO right. 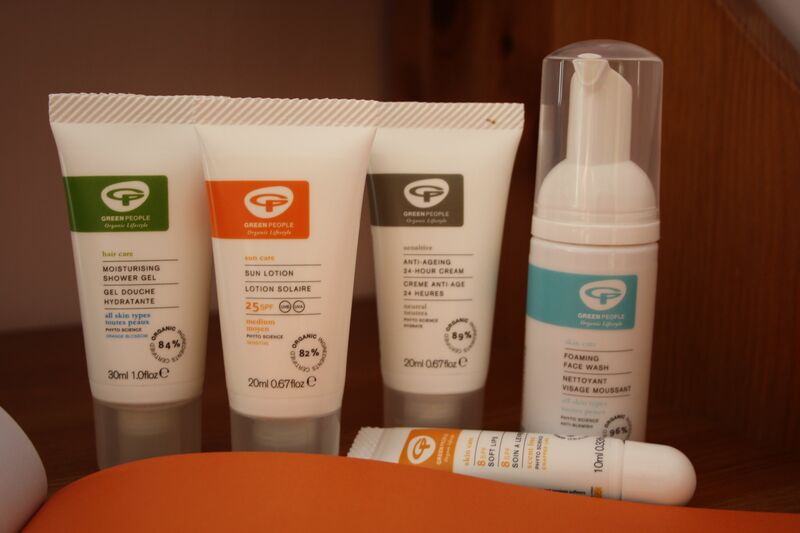 It contains: SPF lip balm, sun cream, foaming facial cleanser, shower gel and a moisturiser. The foaming facial cleanser and shower gel are perfect as they both only need just a little bit of water to keep you feeling fresh. No need for a face cloth, and no fuss. The sun cream (SPF 25) is multi purpose as it can be used on your face and the lip balm is really nourishing and luxurious. I personally am not too worried about the moisturiser as my skin doesn’t need it so much, but on a hot weekend it could be your saving grace – it’s anti-ageing too! I’ll pop a full review live soon, but I highly recommend this! Festivals generally don’t mind you washing over the grass so long as you use eco-friendly products so this is perfect! Just because I don’t recommend horrible sticky and gross baby wipes doesn’t mean that all wipes are out of the question! These are so good, they’re just great for emergencies (ie when you spill your drink all over yourself), or just want to freshen up your hands before or after a meal. 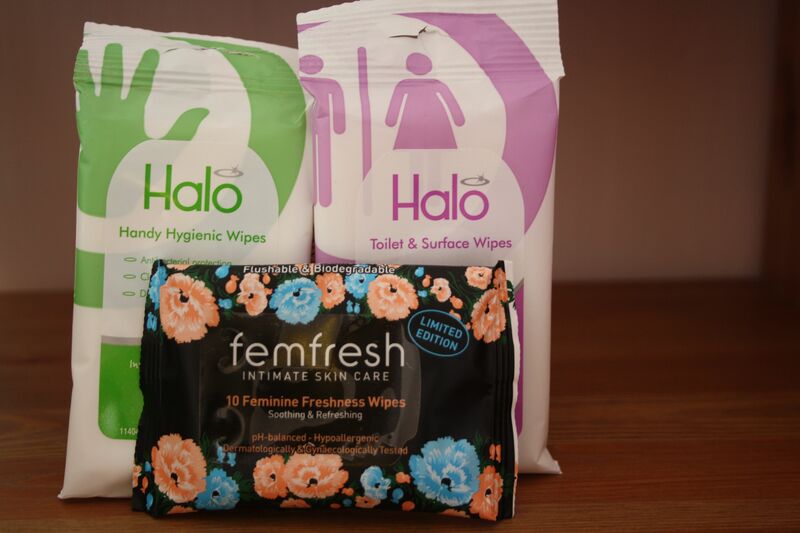 These Halo ones are available from Tesco for about a quid, but they ‘cleanse, refresh and moisturise’, so they won’t leave your hands all dry and ‘orrible. These are literally a godsend. They are PERFECT for the dreaded portaloo. You know what it’s like.. Sunday afternoon (or all weekend for that matter) and they’re gettin’ a little funky – just get one of these bad boys out and you’re good to go! The pack is small enough to stuff in your wellies too so you can whip them out at any time – winner! Need I say more? You’re going three or four days without a shower, but that’s no excuse to neglect your nether regions. Perfect for when the portaloos are out of toilet roll too! I love the Muc Off brand, and I’m a total addict of their car cleaning stuff (seriously it’s like a whole new realm of product hoarding). If you really can’t be arsed to have a shower, wash over the little sinks OR if you have a bit of a gross other half that refuses to wash all weekend (feel ya pain!) then I recommend this little foaming cleanser. 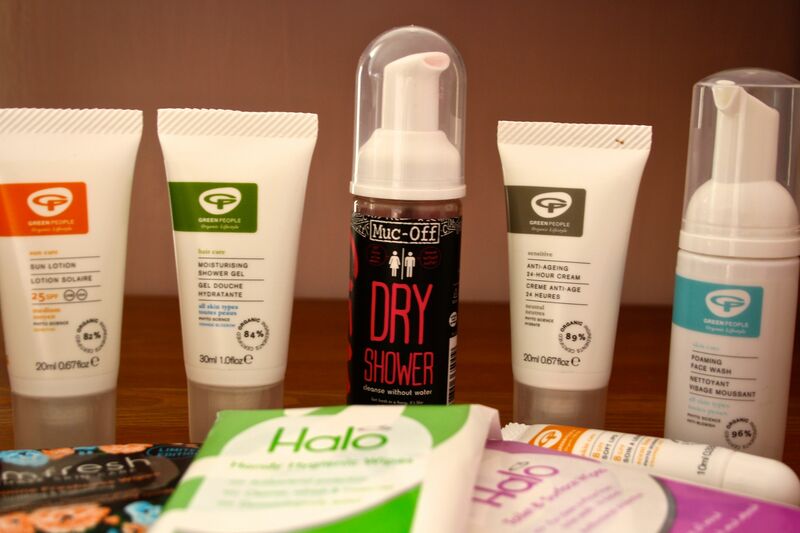 It’s got completely gender neutral packaging, it’s a great handy size, smells like coconut and is free from nasties. What’s not to like? I’m not going to recommend dry shampoo here simply because I don’t use it. If you’re an addict, by all means take yours along, but I personally feel a lot fresher when I’ve washed my hair and it’s easier than you’d expect over the little sinks or with a solar shower. When washing your hair over the grass it’s really important to use an eco friendly shampoo or conditioner. The best solution for me are the Lush shampoo bars as they are light and protect you from the dreaded product explosion in your bag. Then just get a travel size of your favourite conditioner, the Liz Earle Botanical Shine one would be a good choice here as it’s so nourishing, or perhaps one that protects your hair against the sun. If you’re on a budget, I definitely recommend those great little empty bottle sets and just using these if you already have products like the ones I mentioned, but personally I much prefer shopping for travel size goodies! Have I covered everything? What are your festival must-haves?